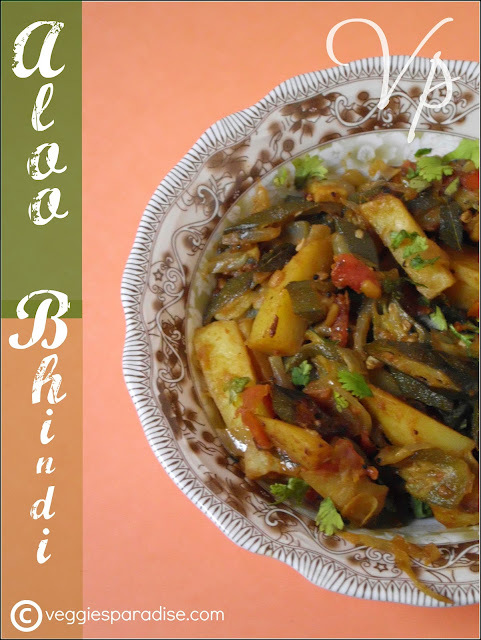 Aloo Bhindi - This is a great tasting fry with the combination of potato and okra along with tomatoes and onions. When buying okra,make sure you choose bright green ones,that snap when bent. I think among all the veggies,okra is a bit difficult to cook,because of the slime and there are quite few tricks to get rid of it. You can add lemon juice or curd or tamarind to get rid of the natural slime and avoid using water. 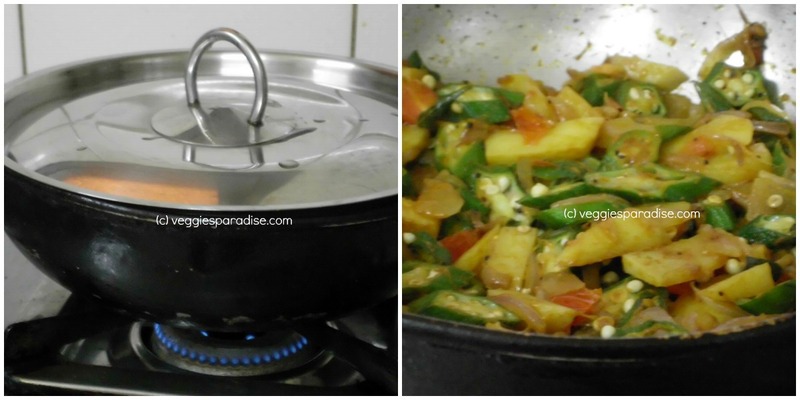 This dish is a wonderful all rounder that goes well with with rice or roti's. Heat oil in a pan.Add the mustard seeds, when they crackle. add the urad dal, curry leaves and fry for a min. Add the onion and fry until soft. Add the potatoes and continue to fry for a couple of mins. Tip in the okra and continue stirring for few more mins. Add the tomatoes. Add the sambar powder, lemon juice and salt and mix well. Cover and allow it to cook on low flame, keep stirring frequently to keep the curry from sticking. When both the veggies get cooked remove from heat and serve hot sprinkled with the chopped coriander leaves. Haven't heard of potato and okra combo nice and yummy!! This combo works out wonder..lovely aloo bhindi. Nice sabzi.. 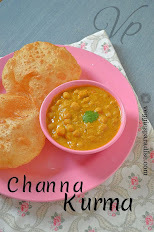 I love it with rotis..
Lovely recipe. I never added lemon juice in this poriyal. Should be great. I am yet to try this lovely combo,recipe sounds very yummy n easy...good one dear!! 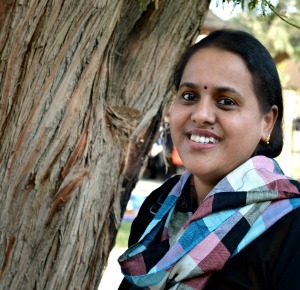 Lovely subzi.. I love the aloo bhindi combo with chapattis! This is my childhood fav. My sister still makes it. Love the combination and I just realized that I never make it. Thanks for sharing. luv the combo...Simple ,yet licking curry..
Great recipe will try it soon. Have both .. will try soon..
delicious recipe... Perfect with rotis.. I've never had this before, but sounds good. Is this your traditional food of your country ?? 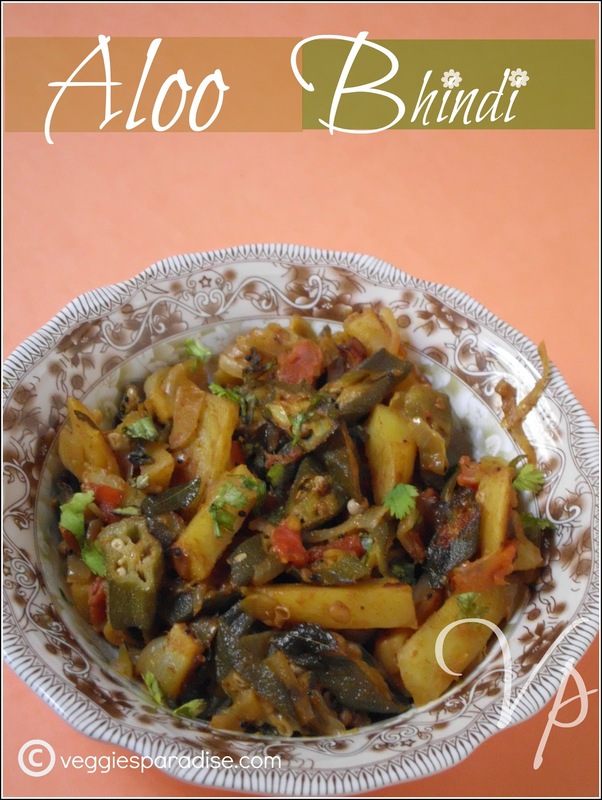 Aloo Bhindi is a different combination and delicious in taste like Kurkuri Bhindi. I have tried it, really Crispy and crunchy.